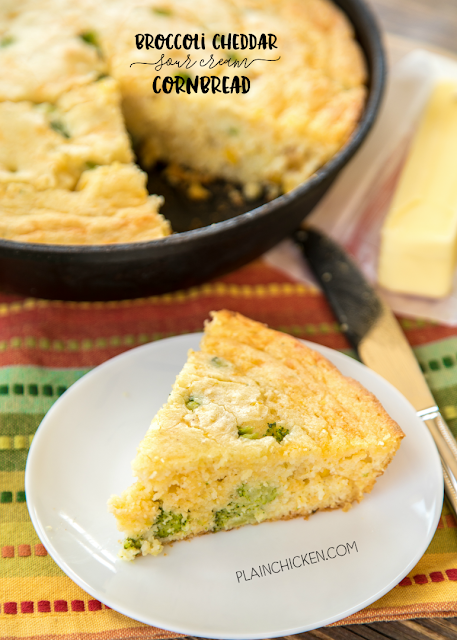 Broccoli Cheddar Sour Cream Cornbread Recipe - only 7 ingredients! Ready in 30 minutes! This is seriously THE BEST cornbread recipe! SO delicious and super easy! Cornmeal, sour cream, creamed corn, eggs, oil, broccoli and cheddar. We love this easy cornbread recipe! Great for potlucks and cookouts. I could make a meal out of it! I could make a meal out of this Broccoli Cheddar Sour Cream Cornbread. It is crazy good!! I usually make this cornbread in a 9x9-inch pan, but this time I put it in my iron skillet. Perfection!! The key to great cornbread in the iron skillet is to preheat the skillet in the oven with a little oil. It gives the cornbread a delicious crust! 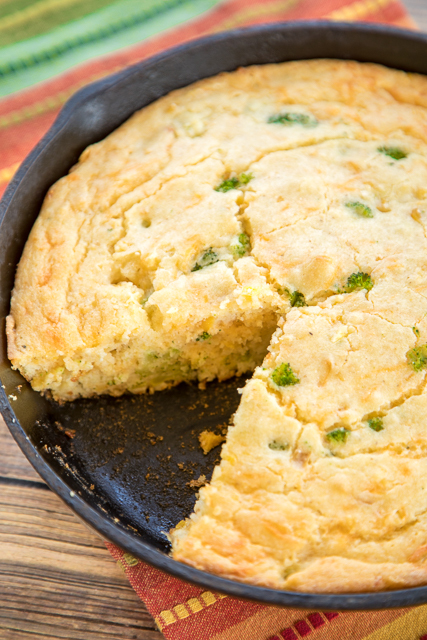 You can use fresh or frozen broccoli florets in this Broccoli Cheddar Sour Cream Cornbread. I've used both and it turned out great both ways. I've only used full-fat sour cream in this recipe. I think light sour cream would be fine, but I would steer away from fat-free sour cream. I just don't think it holds up as well in baked breads like this. BUT you can do whatever you want. I'm not in the kitchen with you, and I'm not eating it with you. We like to serve this with our favorite grilled recipes. It makes a lot for two people, so we usually eat it leftover the next day with lunch. It tastes great leftover smothered with butter too. Place 2 Tbsp vegetable oil in a 10-inch iron skillet. Place in cold oven. Preheat oven to 450º F (with skillet in oven). Remove skillet from preheated oven and pour batter into skillet. Return skillet to oven and bake for 30 to 35 minutes, until golden brown.